After announcing Batman: Arkham Knight’s Dual Play feature that lets players play as multiple characters, Rocksteady Studios is now showing off how you’ll be able to switch between characters on the fly. The Let’s Play video below shows Batman and Nightwing fighting a group of enemies, and demonstrates collaborative takedown attacks that allow players to immediately take control of a second character and play as them as long as they’re present. 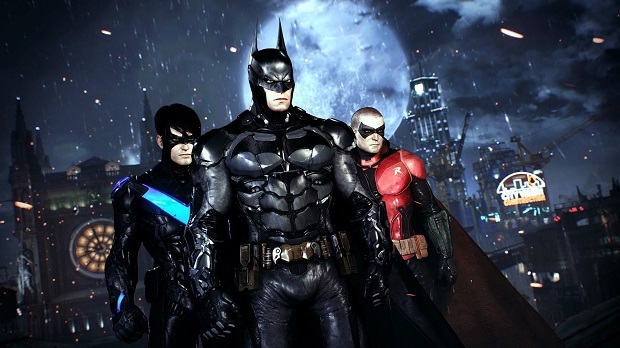 Nightwing, Robin, and Catwoman have all been confirmed as playable characters through Dual Play. Arkham Knight is coming to PC, PlayStation 4, and Xbox One on June 23rd. Warner Bros. recently detailed the game’s $40 season pass, and it will contain story content that brings in more playable characters.